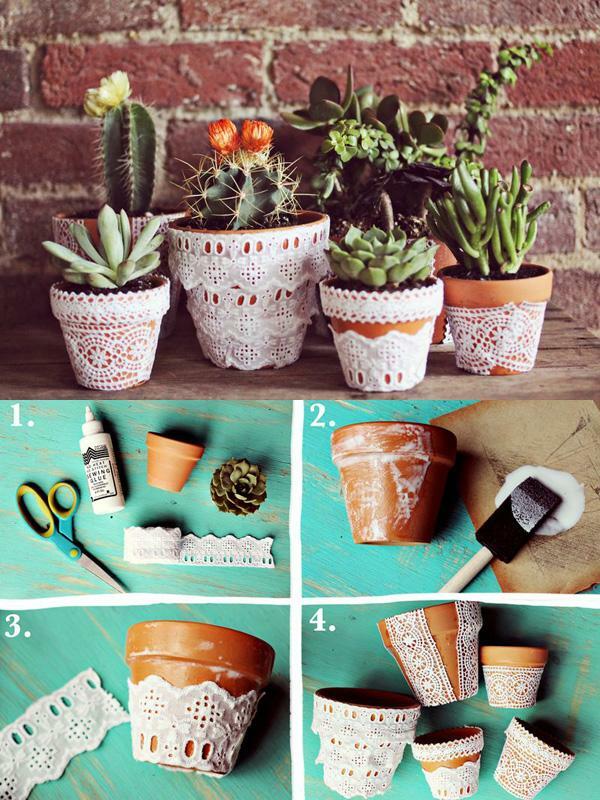 Lace does not have to be just a decoration on some piece of clothing, it can decorate your pots. 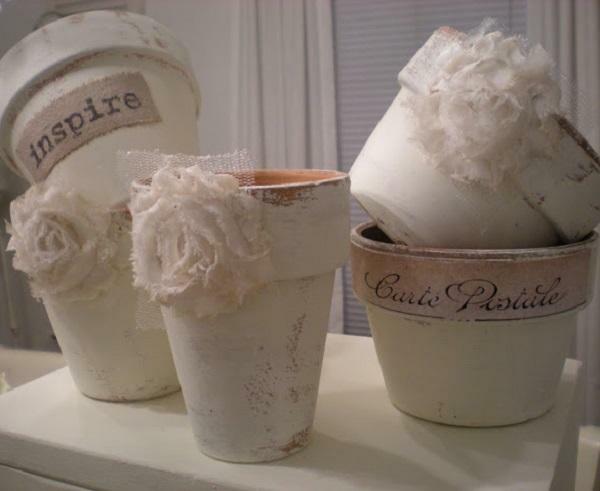 With help of lace, with adhesive and little effort you will have new, delicate and beautiful flower pots. The spring came and already gardens, trees and parks have been colored in magnificently green. I love that green! I love that spring! Kinda like that when I wake up and get a new, fresh, vital energy. The first flowers a long time ago started to decorate our gardens and balconies, such as snowdrops, hyacinths, violets, but slowly being replaced by those of the long-term and that will bloom all summer. With the first rays of the sun and the hint that spring arrived, I deeply believe that all of us, ladies, but and men of course, hurried to the market and in flower shops to buy favorite flowers that will plant in a pot. And when it comes to pots – the choice is huge. From regular plastic, over those with interesting pattern and details, using clay, ceramic, stone, concrete. 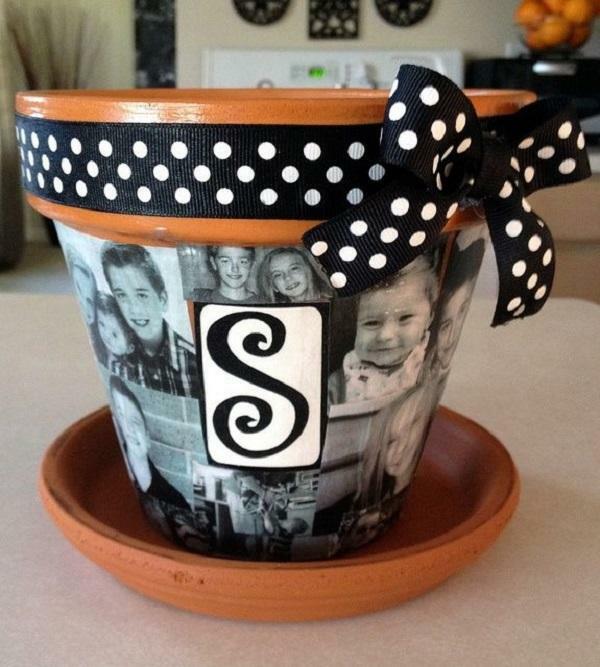 Beautiful pots will decorate your yard. I’m sure that you keep your favorite ones from the last year but it does not hurt to enrich your collection with some piece this beautiful spring. Your garden should be a corner where you feel most comfortable and where you will enjoy, especially in the spring and summer. Its arrangement needs special attention. I deeply believe that the green color relaxes, and the nature also, the scent of freshly cut grass, the smell of earth after the rain, the smell of flowers and nature… And if we add a fountain in the courtyard that will constantly babble, little paradise has been created. Of course our backyard should not be crowded with plants. Plants can’t fight for space and water, and therefore they should have enough space for growth and development. Devote your attention to the yard at least once a week. Many people enjoy the weekend in revamping garden. At least once a week, check for weeds and cut down it. Clean paths regularly because when the wind blows easily pebbles and leaves can reach them and it looks a bit messy. To enjoy the evening do not forget lighting. The solar lamps are perfect for lighting the garden at night. They accumulate light during the day and at night shine. In addition, there are the most diverse forms of interesting but you nicely select it according to your taste. Your yard can become very original if you have completed the course with a stone colored tiles, some trails are like cobblestones. All this can look nice in the decoration of the yard. The French have a special secret concerning gardening. They like it when big windows in their homes and patio doors overlooking the beautiful green garden. They prefer to let their flowers in their pots and gardens sometimes wild and not have strict proper form. Thus yard gets soul. The French very like iron elements in the garden, because they emphasize plants. Choose a fine iron bench or a table and chairs also made of wrought iron with large pillows that will give it the warmth. Anyway, like it has always been in life, this should be based on your own wishes and ideas and this time choose flowers for decorations, garden, choose pots that you like. That affect your senses and make your space magic. 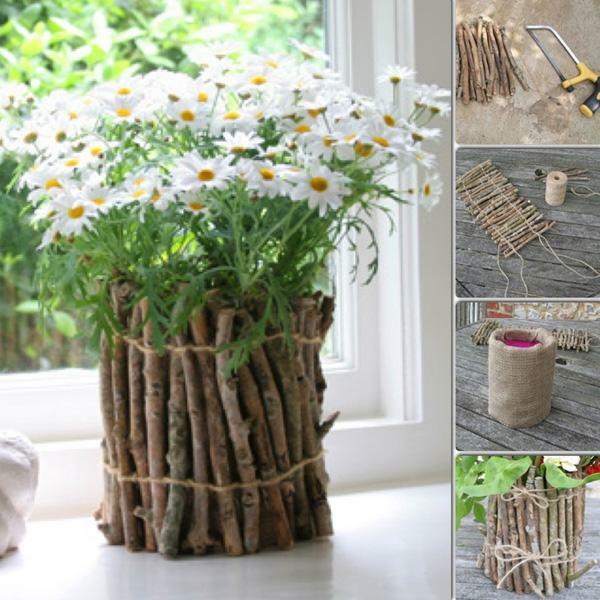 Here are ideas for pots that can be a beautiful decoration of each home and garden! 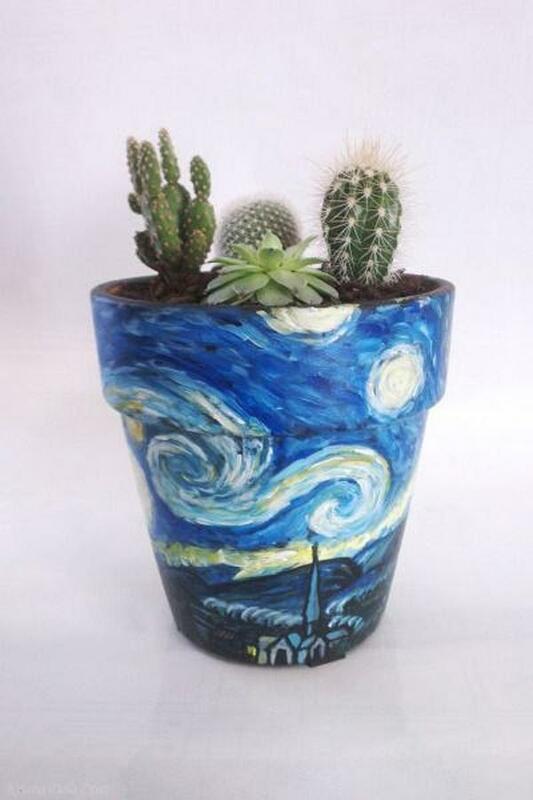 Little imagination is needed to your ordinary, monochromatic and boring pots with the help of paint convert into interesting ornament of your garden. Today are very popular plastic pots. They had a great application, however, clay and plaster pots are much nicer and more elegant. They will give your room a touch of elegance. 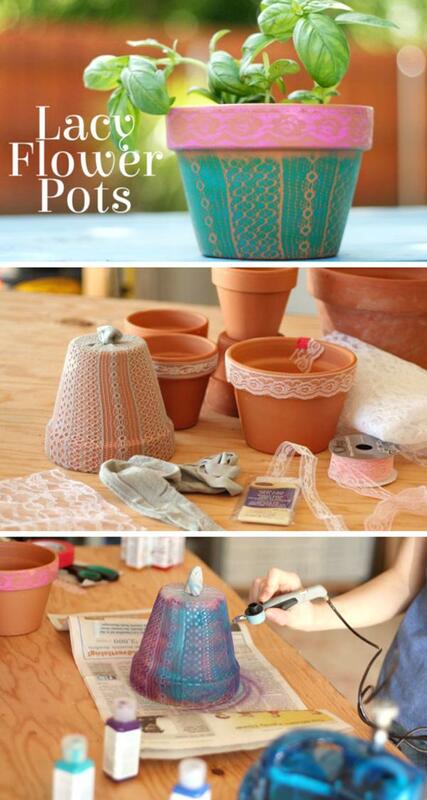 You can paint the pots by pulling on them the lace or some interesting material and then apply spray, for example. When you take the lace, there will remain patterns as lace. 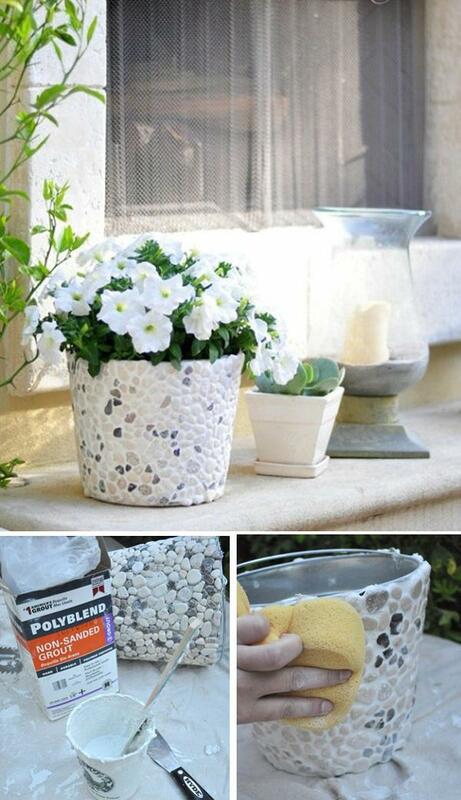 On an ordinary metal or wooden bucket, put the tile adhesive or mortar drip on them to stick pebbles or broken tiles. Flowers are a very beautiful decoration of any home, it gives him life and warmth. 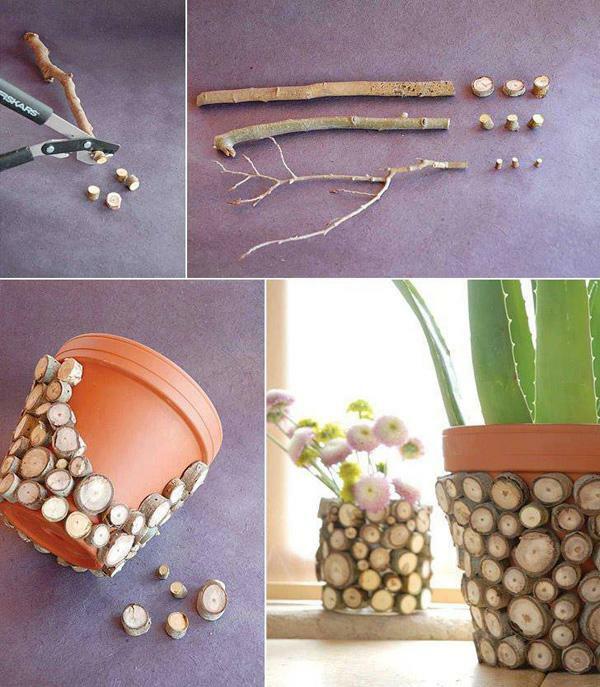 Thin wooden sticks here are creatively used for coating ordinary and boring pots. 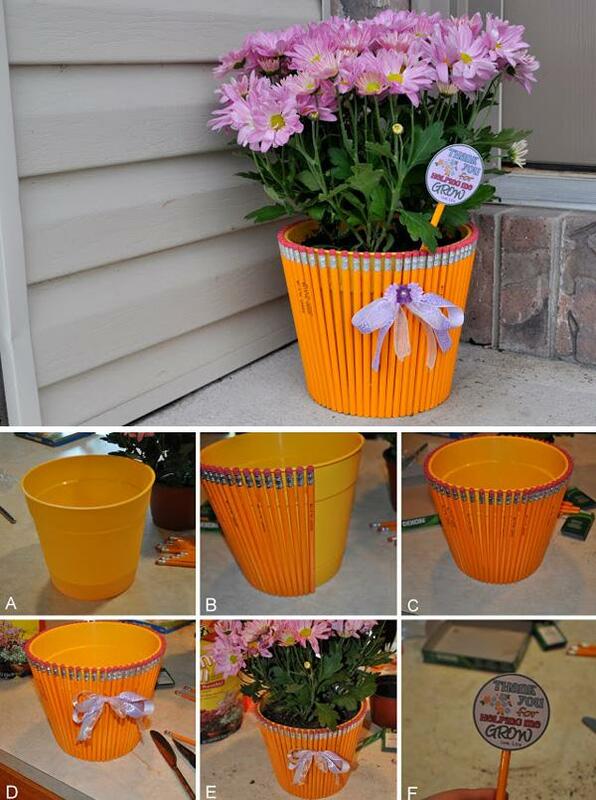 Decorate your pots with colorful threads which you will stick on the pot. 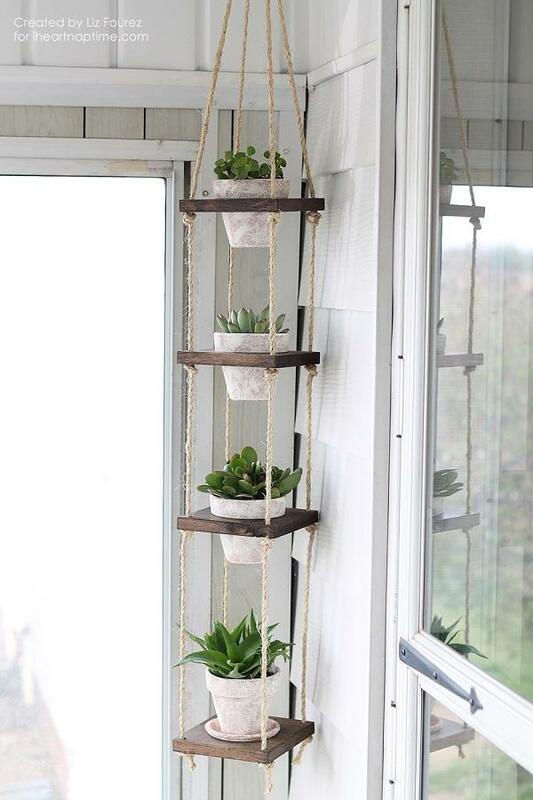 Easy and fast way for decorate. Flowers are an essential detail that every little private paradise must contain. 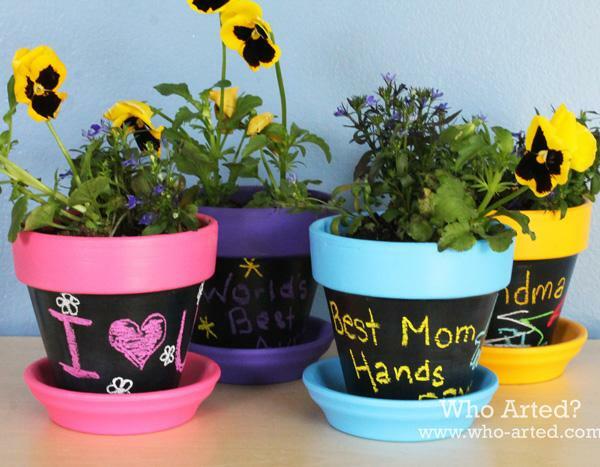 On your pots can print the most diverse motivational messages or a dedicated. Here’s an idea how the crayon used for that purpose! People often grown herbs alone by themselves because they believe that the quality of the plants cultivated in home is better than purchased. 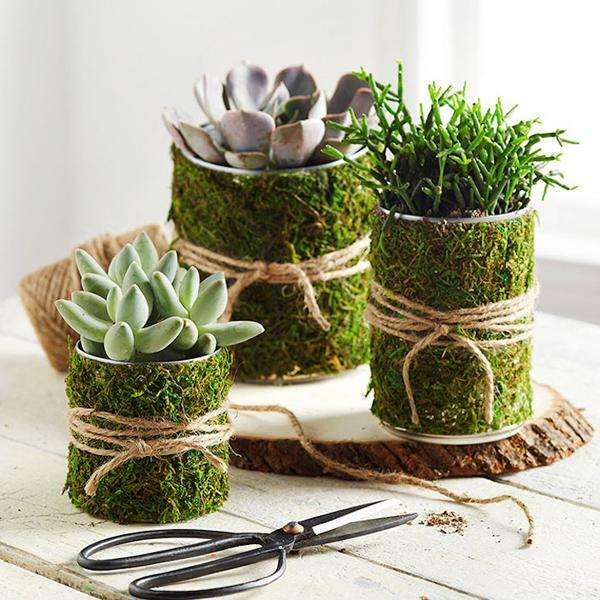 There are templates that you can buy or make at home, and with the help of spray paint to decorate different objects and even flower pots. 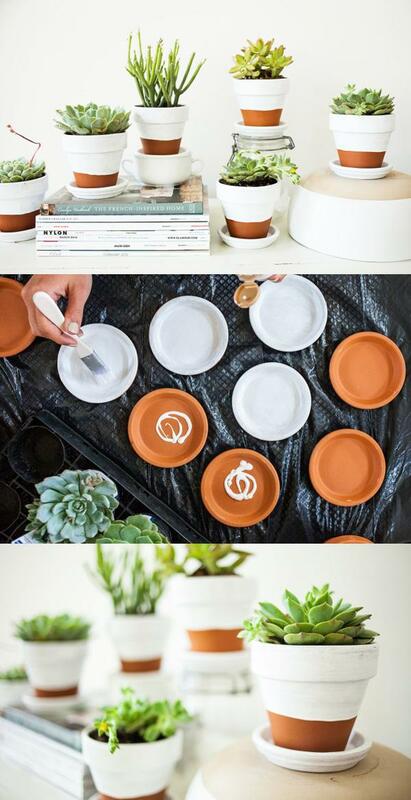 Monochrome pots you can easily decorate using different colors. 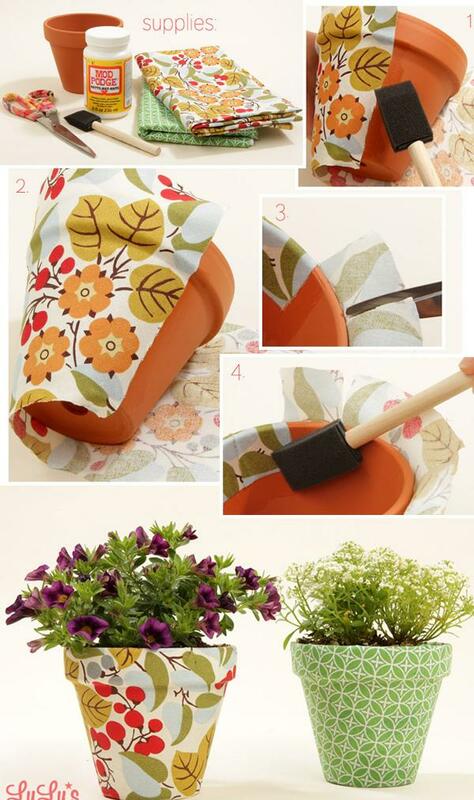 Thus, the pot will seem merrily and your garden more beautiful. Soft pink color that resembles on water smeared color in different shades can be used wisely for decoration! And for those who love nature and the natural appearance of the object in the house and in front of the house, here’s an idea. Cut into rings tree, and those rings stick on the pot. The result will be great! Ombre can be applied in decorating items also, except that here passes from darker to lighter shades are sharper. If you are not sure which color you choose when decorating pots decide for eternal classic combination of black and white! 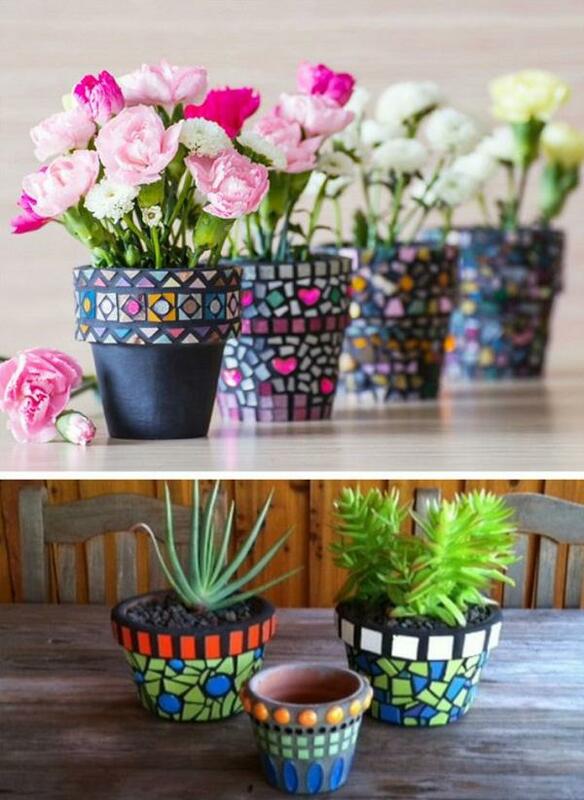 Colorful materials except on your body can be a decoration and of your pots! 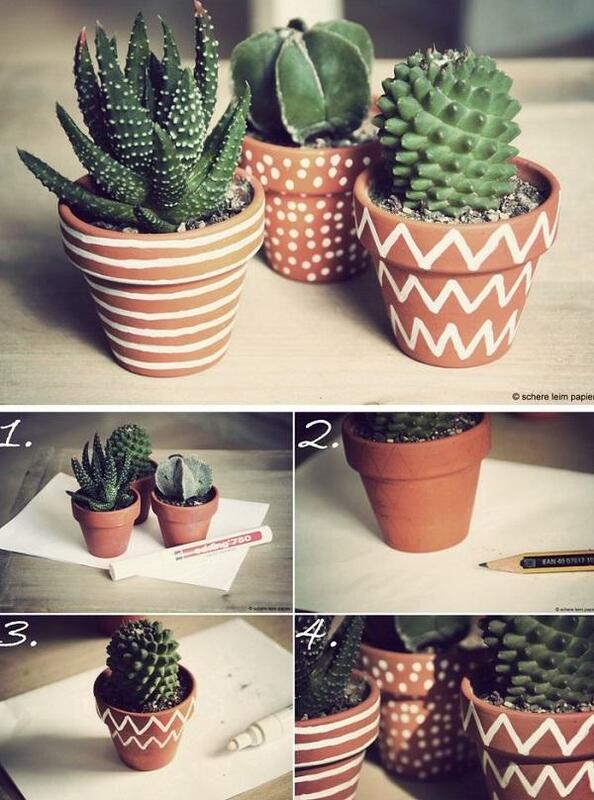 Choose favorite pattern and change your pots in the material! Flowers is the most beautiful decoration of gardens but it doesn’t need to be just in the pot – it can be on the pot in the form of floral motifs printed or glued on them! 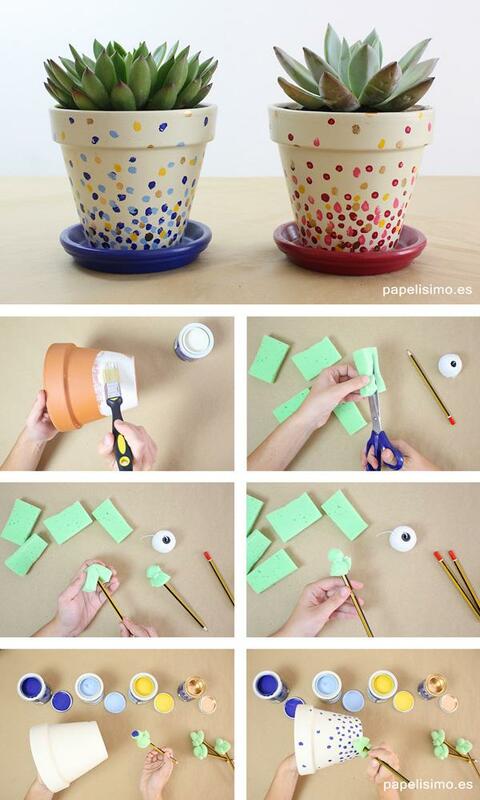 Floral motives can be achieved by gluing colorful stickers and materials on the pot. Let your kids and favorite family members help you with decorating. Let this work be a game with them, andt here’s how you can play that game! The rustic appearance of new clay pots will be achieved if little of white paint or spray paint you apply to the pot and rub it with the sandpaper to look ethnic. Irregular geometric shapes with irregular lines can be drawn with brush and paint with freehand. IKEA is one of the largest chains for selling furniture and other things necessary for every household. Flower pots are part of their range, too. 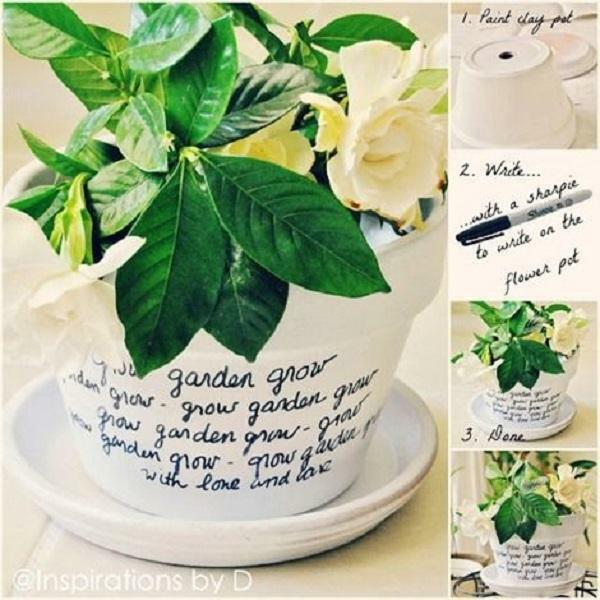 Rustic pots can be decorated with bows and roses made of material. It is best so decorated pots to hold on the covered terrace so you do not need every time it rains to chase and move them in order to avoid damage! Pieces of tiles, colored glass and little rocks for many people are favorite material for beautification of various objects and parts of the house. Mosaics are always very popular and attracts attention. Arm yourself with patience because it is an easy but sensitive work, use your imagination and you will get from the old ones new fancy pots. Small works of art aren’t worked only on the canvas, an artist does not choose a lot a ground on which will show his current inspiration and creativity! 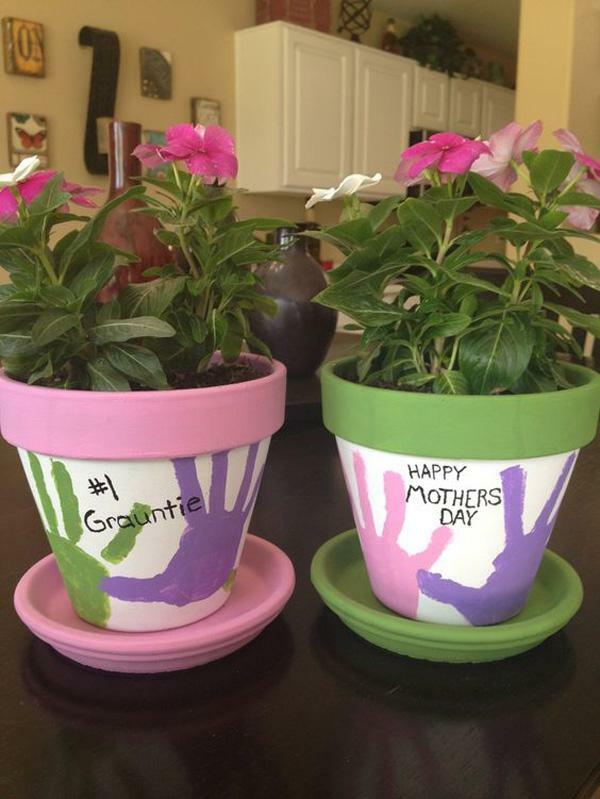 The most beautiful flowers in our life are our youngest and here’s how our wonderful flowers on terraces and balconies we can decorate with their pictures. 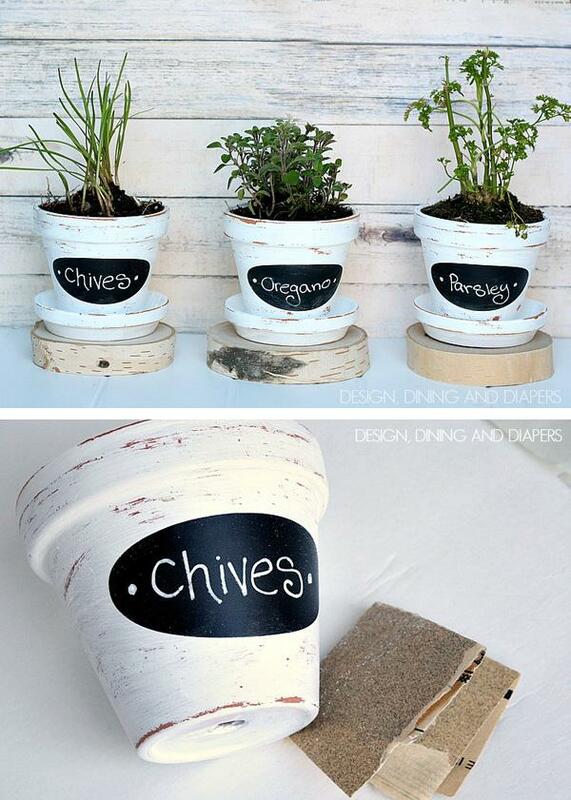 Using different stencils create various forms of clay that you can stick simply to plain pots! A decoration with sea shells and starfish that you brought from seaside, you can use in this way also! There are a lot of ways. Decoration depends of your imagination! 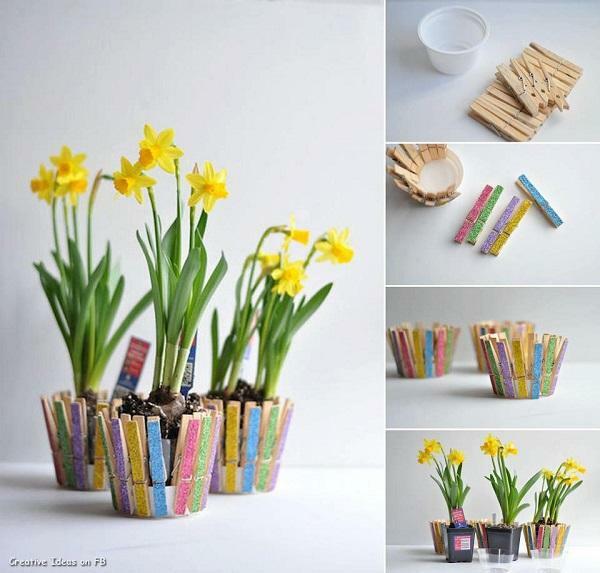 If you have children, with them, in this way decorate the pot using pencils. For them will certainly be interesting to use the pen in some other way! 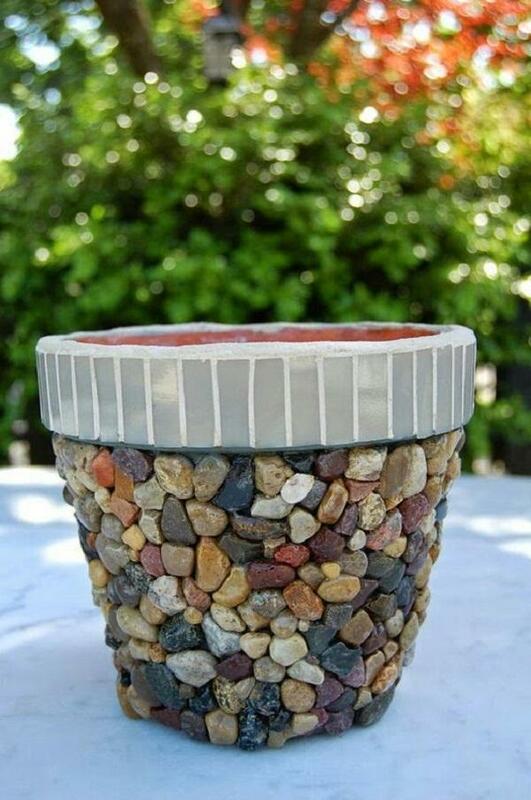 Here is another colorful stones used in a very nice way for decoration of the garden and yard. 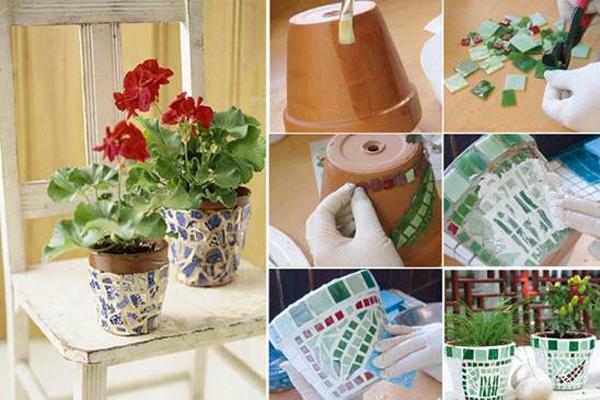 For interesting patterns can you use stamps, which will pattern that you sketched on it faithfully replicate on the pot. Even the base on which you will set the pot can be attractive and interesting. You can make it by yourself in your spare time. Here’s an idea for it! Black and white elegance on pots. With flowers there is no jokes. It is spring and the season of weddings began largely… Make decision for warm wooden flower pots that will be a great decoration for your main decoration on the wedding – flowers. 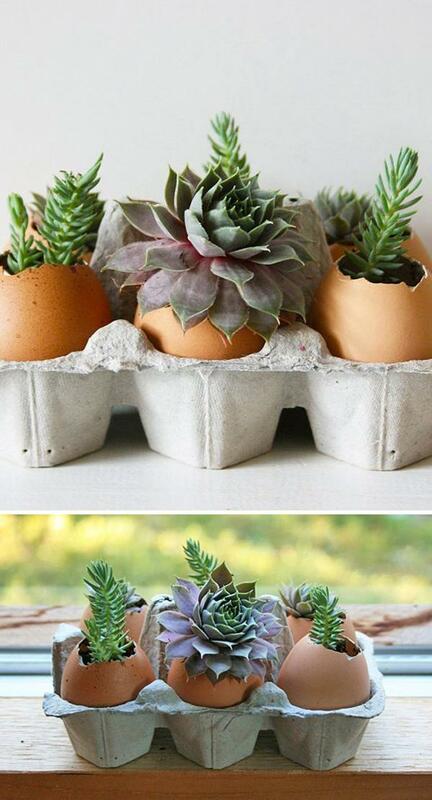 Egg boxes of cardboard and peeling of the eggs can be used for the cultivation of small plants. I extremely like moss, its beautiful color can enrich any space. Paint the clothespin in various colors and use them in a little different purpose than that on which you are accustomed. 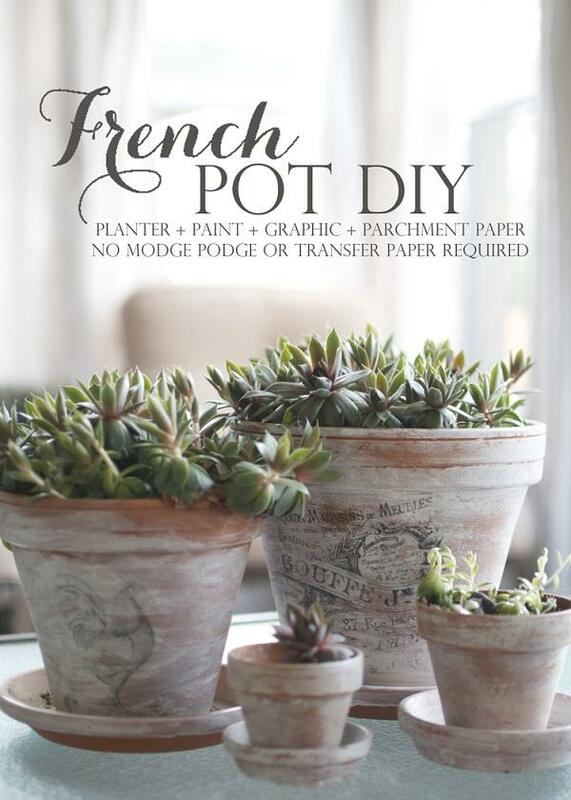 Who says that the pot must normally be round and made of plastic, clay, concrete… They can be made from books. But I advise you, choose books you’ve read a thousand times (and even then I would ask myself to do it). Opt for one that you have double. Lines of different shapes in white BOJIN ordinary pot can be very effective! Bright colors such as pink, green, yellow, light blue, are the colors of the spring and they will be a good choice. Paint pots, you can find paint for pots in any better stocked store. 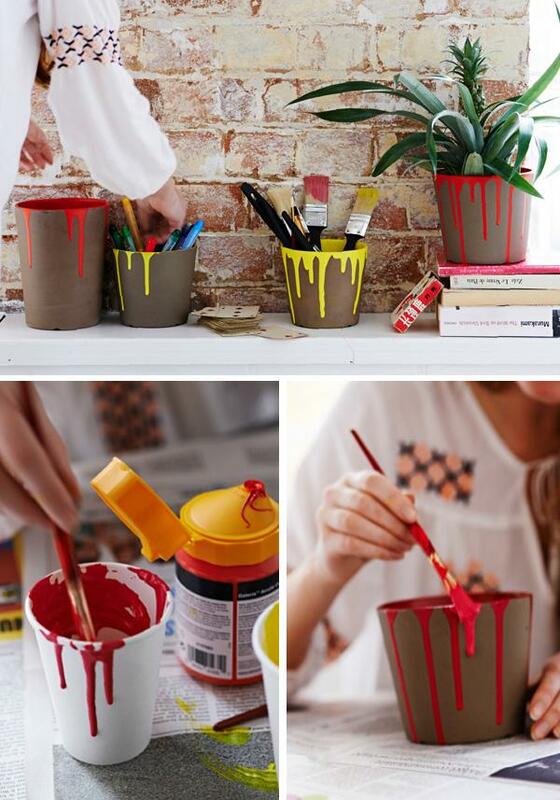 Let your imagination run wild and repaint your pots so that no one of the guests be indifferent.